Looking for new cost effective construction methods the German municipality of Wuppertal has turned to giant Lego bricks. Citing the cost savings in multi colored plastic officials say they have avoided any budgetary shortfalls. This Lego bridge is actually the creation of graffiti artist Megx (martin heuwold). 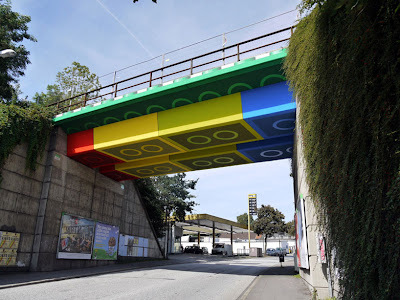 Painted to seem as if the bridge were constructed of LEGO bricks it took Megx 4 weeks to complete with a full construction team onsite to oversee the development of the project.